Fear not. 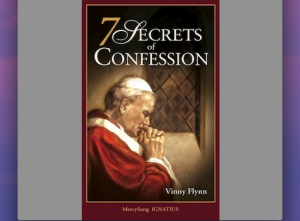 The title, 7 Secrets of Confession, is designed to grab attention not break the seal. In fact, Vinny Flynn has penned his own “books of numbers” as author of 7 Secrets of the Eucharist and 21 Ways to Worship. This latest book serves as a helpful guide to Confession for those who have been away and even for those who frequent the sacrament. We all are prone to pride when it comes to our sins; some seek to hide them, others focus on them too much. Both groups can lose sight of God’s overwhelming love and abiding mercy. Flynn covers these issues and more in a brief yet deep treatment. A popular speaker at conferences and parishes, Flynn works closely with the Marians of the Immaculate Conception in Stockbridge, Mass., promoters of St. Faustina’s Divine Mercy devotion, and is executive director of MercySong Ministries of Healing. He is the father of seven and the grandfather of 27. Fathers for Good contacted him by e-mail. Fathers for Good: What is your favorite personal Confession story? I ended up laughing, too. He knocked me right out of the self-accusation and self-pity I had been wallowing in and reminded me what confession is all about. It’s when my misery meets God’s mercy. My weakness, my unworthiness, my sin can bring me to realize that I need God. When I’m feeling miserable, guilty, and ashamed, knowing that I’m not who I ought to be, and I bring all that into the confessional, God fills me with his healing love and gives me the grace I need to begin again. That’s what St. Faustina teaches — Confession is when our misery meets his mercy. We can’t emphasize that too much: God in the confessional is mercy itself, and his love restores us to new life. Flynn: I have to “confess” that I chose that title for the shock value — to get the reader to sit up and take notice of the important point behind it. I’ll try to briefly summarize some of what I explain in the book. No need to worry, confession is private in the sense that the “seal” of confession is real, and the priest is strictly bound to make “no use” whatsoever of anything you say in confession. So your dark secrets are safe. But, in a deeper, mystical sense, it’s not private. The priest is not acting on his own; he’s acting “in persona Christi” — in the person of Christ. Through his sacramental identification with the priest, Christ is really present. He himself is listening. He hears your confession; he acts in your soul; he absolves you from your sins and fills you with healing grace. And since Christ, as the second Person of the Trinity, is never alone, the Father and the Holy Spirit are there, too. The confessional is a “Tribunal of Mercy,” a loving, personal encounter with the three Persons of the Trinity — and they’re not there to judge or punish. They’re there to help, to comfort, to heal, and to sanctify. And there are others involved, too. Christ tells us in the Gospel that “all of heaven” rejoices at one sinner who repents. So all of heaven is “listening” too, and rejoicing with you as you return to the waiting embrace of the Father. FFG: Some view Confession as a burden. You say it’s more about freedom. Flynn: Confession is only a burden when we don’t understand what God wants to do for us in the confessional. We don’t understand how completely and tenderly God loves us, so we get caught in our fear and shame, pride and guilt. The real burden is sin and the woundedness that leads us into sin. Our wounds, our confusion, our weaknesses, our sins are like chains hanging around our necks, weighing us down and keeping us from being who we were created to be. This chapter is the longest in the book, and from the responses I’ve had so far, it seems to be the most powerful chapter for many people. I explain the various barriers — especially the “Father Wound” and unforgiveness — that keep us from receiving the love that God wants to give us; and I suggest ways that we can allow Christ in the confessional to break these chains that bind us, so that we can finally be free of them. It’s really important to come to understand this in the context of the overall theme of the book: that confession is not just about behavior; it’s about relationship with God. And it’s not just about forgiveness; it’s about healing. We all need so much healing. And the confessional is the main place where it happens.